A bronze beaker of slender vase shape, supported on a tall tapering foot. The bulging body has a waisted neck that flares strongly outwards at the rim. 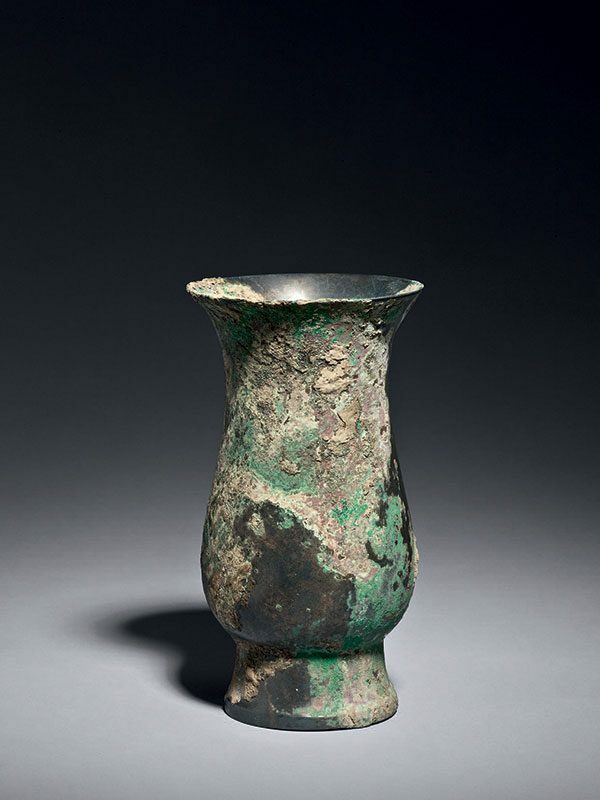 The vessel largely retains the original gold.flecked surface, which is now suffused with large areas of malachite patina that has some cuprite inclusions. Extensive traces of burial earth and fiber remnants are visible on the surface of the vessel. The function of this elegant zhi beaker is to contain liquids. The shape of the vessel is similar to other early bronze forms such as the zun, but the zhi has a narrower body in proportion to its height than the zun, and is considerably smaller. The shape and the casting perfection of the vessel were achieved by employing the piece.mould technique, where first a clay model is made and soft clay is pressed against the model to create moulds with a negative impression. The model was then taken out and shaved down. The moulds and the core are subsequently reassembled, and molten bronze is poured into the narrow space between the core and the assembled moulds to form the shape of the vessel. It is unusual for zhi vessels to be totally plain; a zhi of very similar proportions with two narrow bands of abstract ornament is in the Sackler collection at Harvard University. A beaker of slightly wider proportions with a band of decorative pattern around the neck was exhibited at the Hong Kong Museum of Art in 1990. A taller zhi of equally slender proportions but with a band of cicada pattern below the rim is in the Meyintang collection.